As you'll see from the links at the bottom of the page Russian band Druknroll do not have a Facebook, or any worldwide social media pages, They are only on VK, which is the Russian equivalent of Facebook. That's a real shame because I think there is a market for this band outside of their home country! 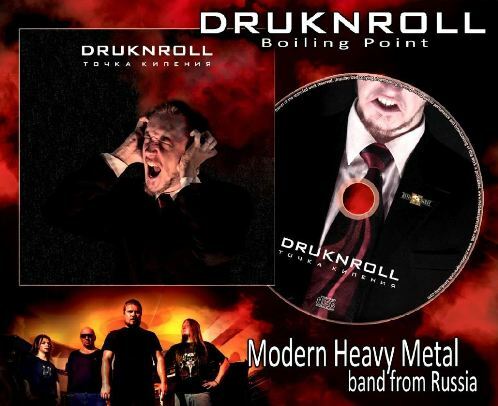 Formed in 2006 as a solo project, Druknroll have developed into a full band and "Точка Кипения" (Boiling Point) is their third album and second for Metal Scrap Records. This is thunderous but melodic Modern Metal that fans of In Flames, Scar Symmetry, Soilwork, Annihilator & The Devin Townsend Project will love. I was extremely surprised by the quality and sound of this album. Production is huge and every instrument is clear. Vocalist 'Horror' has an almighty roar but is able to channel emotion and quieter moments easily and he can really sing when needed as well. It's his phrasing and inflections that remind me of Devin Townsend and I really don't give a damn that he sings in Russian. What really stands out here though is the quality of the songs and riffs. Band leader 'Druknroll' (guitars, bass, keyboards) really knows to pen a catchy, but heavy tune. Along with 'Knip' (lead guitar and sound effects), whose solos are absolutely superb, they whip up a storm. Just check out opener 'Rage' or 'Samurai', 'Defence Of Sevastopol' and 'White Death' for proof! Add to that the canon hammer drumming of 'Jester' and you've really got a band that has made me sit up and take notice! Judging by some of the recent albums I've been sent there are definitely some awesomely talented bands emerging from Russia and the Baltic Countries that people should be checking out and Druknroll are one of them. Now they are with Metal Scrap Records some more press should come their way but they need to embrace the technology around them to give the band the publicity they very much deserve! This is great stuff!